Plan based on Viola, Gli Scavi di Pompei dal 1873 al 1878, in Ruggiero M, 1879. Pompei e la regione sotterrata nel Vesuvio nel anno LXXIX. See also La Rocca, De Vos and De Vos, 1976. Guida Archeologica di Pompei. Mondadori Editore, p. 307-9. Use the pompeiiinpictures plan of the Terme centrali or Central Baths to access the photographs. 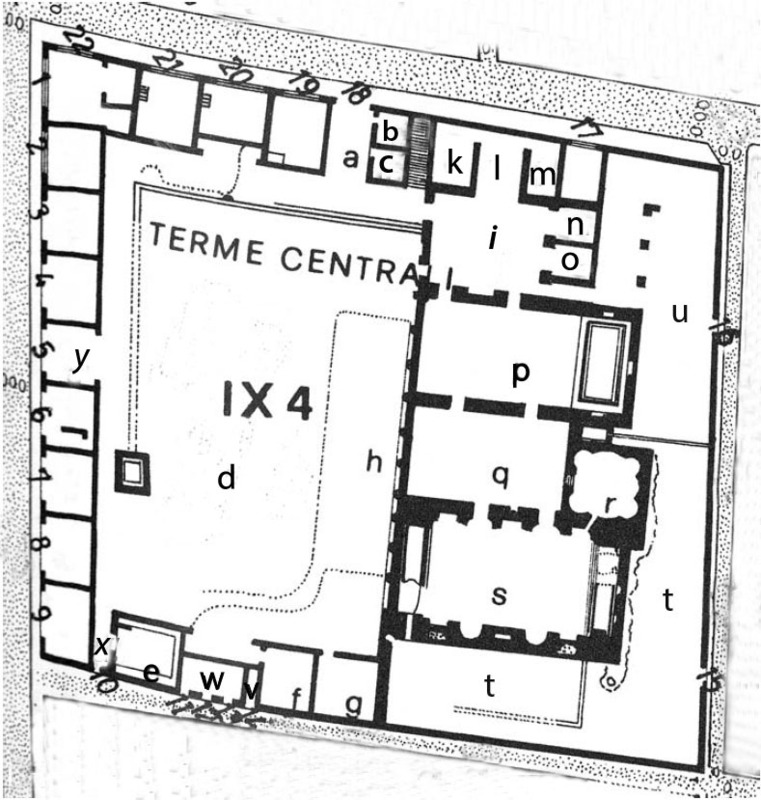 The room letters are those referred to on the pompeiiinpictures pages for the Terme Centrali or Central Baths. IX.4.1 Corner shop. Linked to IX.4.22. This plan is to help you accurately locate the properties and rooms shown in the photographs of this insula. They are based on those used by Viola with additions by us (t to y) for clarity. Please be aware that the plan may differ from other plans or records both published and unpublished.